There are lots of ways that our Labrador Retriever friends make us happy. [wp_ad_camp_5]We have been looking at some great ways that we can return the favour, and make sure we have a happy Labrador too! Whether it’s their company when out on walks or snuggling up at home, they make our lives nicer. So it’s really important to return the favour. We have been thinking about the 7 ingredients that go into baking up a happy Labrador. Labradors need an appropriate diet for their breed, as well as their age and size. Dogs do not need the same food as humans, they need specially designed dog food or a planned raw diet. Many human foods can be toxic to dogs. And obesity is an increasing issue in our pet Labradors, and one that needs to be taken seriously. A Labrador who is in the right shape, will be far likelier to be a happy Labrador. They will have more energy and be less prone to associated health issues. Labradors are active dogs. The fitter they are, the more able to enjoy life they will be. Make sure not to over exercise young dogs though, as their growing joints may be more prone to problems such as hip dysplasia. 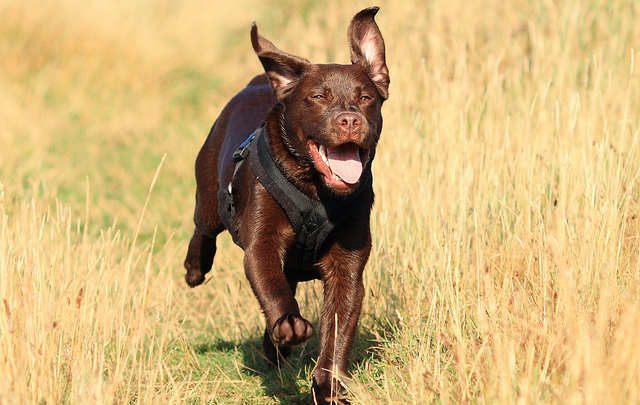 Long walks in the countryside, swimming or playing are great fun, but they are not the only ways to keep your Lab fit. Training can help with this, without wearing out your legs as well! Teaching your dog to retrieve can be a great way to keep him fit. As well as entertained. [wp_ad_camp_2]As a born retriever, your Labrador will in all likelihood to programmed to adore chasing and bringing back things to you. Harness this innate ability, and he will have great fun as well as staying fit. An obedience trained dog is also a welcome guest at other peoples houses. He will be more likely to accompany you when you are out of the house, which will hugely increase his quality of life. Check out our training section to find out how to achieve this. People like routines, and most dog are no different. We like to know approximately when our meals, bedtime and recreation time will be. Having a stable home life helps to keep a dog feeling reassured and confident. In order to be happy, your Labrador needs to be safe. This means his garden needs to be enclosed so that he can’t escape and potentially come to harm on a road. He also needs to not have access to anything that might poison him or hurt him if he tries to chew or eat it. There are so many ways to have fun with a Labrador. From playing games and training, to cuddling up on the sofa together in the evening. We all need some fun in our lives, so make sure your best friend gets a bucket load. It sounds sappy, but the final ingredient is the most important by far. Your love for your Labrador will drive you to try harder to keep him happy. To make his training fun, his walks interesting and his home time filled with joy. Here are 10 reasons we love our Labradors so much. Check it out and add yours! Can you think of any more ingredients that go into the mix for making your Labrador Retriever a happy pup? Why not let us know in the comments! Previous articleClicker Training : Find Out What It’s All About. I’m curious, what would “over-exercising” be? Walk-wise I mean? Would over an hour be too much of walking? My dog is 16 months old.